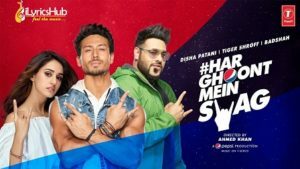 Har Ghoont Mein Swag Lyrics by Badshah featuring Tiger Shroff and Disha Patani. The music and lyrics of the new song is given by Badshah while Song Directed by Ahmed Khan. Har Ghunt Mein Swag Hai..